National Aviation Services (NAS) held its first Annual Recognition Awards ceremony to felicitate employees, departments and global stations for exceptional performance in 2017. Four awards were announced for NAS Kuwait, while one was a global award for the Best Global Station. 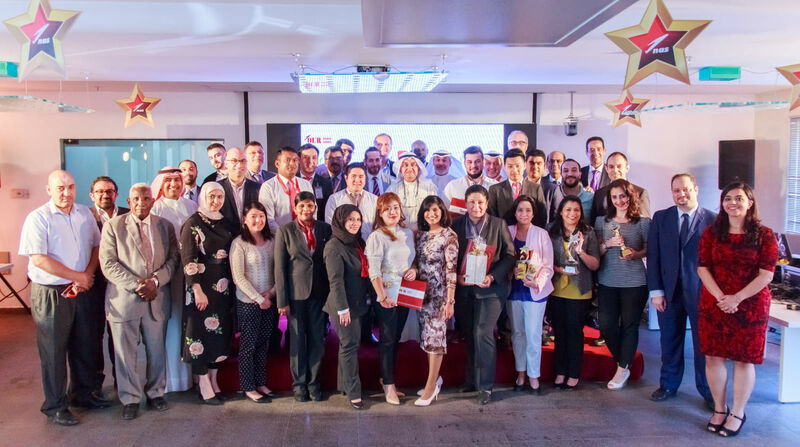 Organized by the Human Resources department, the event had the ambience of a red carpet awards night and was live streamed online so employees from other countries could also view the proceedings. Adel Malallah, Chief Government Relations Officer and Mansour Ali Al Kheziem, General Manager from Kuwait station along with Cisse Abdoulaye, Group Chief Operating Officer – Ground Handling and Cargo graced the event and helped boost the enthusiasm of all attending employees. The Employee of the Year 2017 for NAS Kuwait Joann Berba was picked from a total of 17 nominations across all departments of the company. The Passenger Services department represented by Mubarak Al Rifai received the award for Best Department – Operations 2017 while the Human Resources department represented by Rabah Bu Hamdan received the Best Department – Support 2017 award. The Outstanding Support of the Year 2017, awarded to the top three recipients of the maximum number of Thank You cards from colleagues, were Abdullah Adhami from IT department, Karen Ngujo from Training department and Anika Dasurkar from NAS Travel Office. All winners received a trophy and a special gift from NAS. At NAS, our multi-cultural and diverse team of employees is core to our success. We continue to invest in training and development programs for the benefit of both our employees and customers. NAS also welcomes talented individuals from different countries to join our multi-cultural and dynamic workforce.